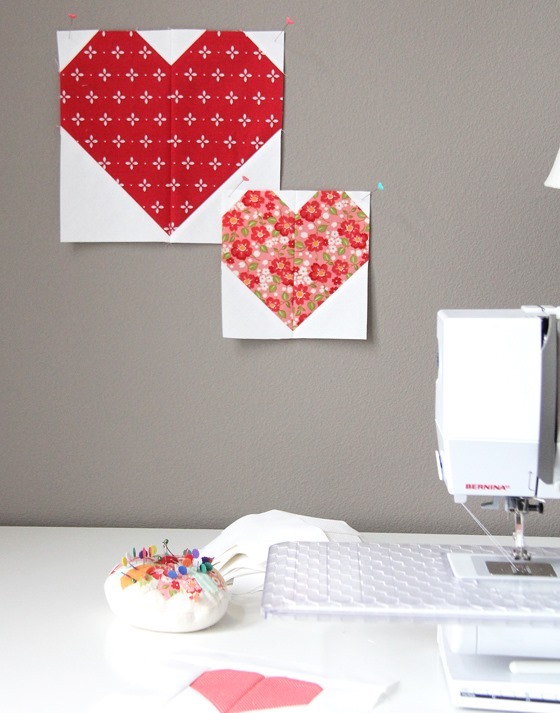 If you want to make a simple heart quilt block in multiple sizes, you’ve come to the right place! I’ve included a free printable pattern with measurements for 7 different sized Heart blocks. Click below to save or print the Heart Block pattern! These are such easy, fast, and fun blocks to make. I hope you enjoy making hearts as much as I do! Oh my gosh, thank you so much! I am still so new to quilting and was having a hard time sizing this up. I am even more excited to make this now. Thank you! I have some ideas brewing but am not sew good at quilty math yet! This is sooo awesome! My guild is having their annual retreat next month and the theme is women's heart health. Would I be allowed to share this with credit to you? I love your patterns and am making basket case with fabric from malka dubrowsky. Whole different look, but still so cool! I have two or three others I have already bought fabric for and working my way toward them. Thanks for your creativity and generosity! you keep quilting exciting! Thanks so much for sharing the sizes! I feel the urge to make sometime like this now that Valentine's Day is right around the corner, and I think a couple of this might be a great weekend project for me! Oh those are so sweet! I've now got an itching to make all sorts of heart shaped things for Valentines and zero time in which to do so! I was so inspired by your heart post that I started one, raided my HST and squares box and ended up with a baby quilt. Thanks so much for the inspiration. Now I might need to make another in a different size. They are pretty habit forming. These make an adorable quilt! This math challenged quilter thanks you!!! Great Tutorial! You make it look so easy! I too started making some from your tutorial- they're just too darn cute!! :) Thank-You, thank-you for taking the time to do the math and sharing! Now I can make them in all sizes!! You're the best! Thank you for sharing the sizes!!! Thank you so much!! I really need your experience and now-how to do this sort of thing for me/us. Excellent! Thanks for the sizes. I have a quilt in the works. I haven't been successful in changing the size! I am so thankful to be following I got your email. Not blogging now because I don't have a working computer. I am at My Journey The Journey Back. Thanks for sharing this and for pinning. Thank you for the additional sizes! 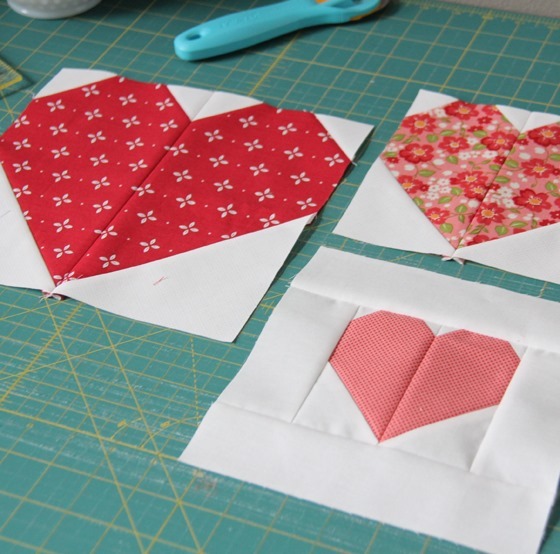 I am working on a quilt using your original tutorial for the heart blocks and they are so cute. I love them. I got 20 made this weekend and 20 more are half way finished. I have to say, working with those 1"x1" squares was a little fiddly at first for me, but once I got going it was smooth sailing. Thanks again for another great tutorial. Ooh, just in time for Valentine's Day! :-) Thanks for yet another great tutorial, Allison! Just wanted to pop in and say thank you for these instructions. The steps were really clear, I made a four-inch heart block and worked it into a kids' tote bag. Thanks again! maths also not my strong point – can you tell me what size the background borders should be for the different size blocks please? Were you ever able to figure this out? I’m making a 7″ square and I’ve not yet found what size the background borders should be. Thx so much!!!! These are adorably easy, and cute!! So helpful that you did all the math for us ;) Happy creating. They are so very very beautiful. This tutorial is so great…thanks, it came in handy at this time of the year. I was wondering…when are you going to have your next (paper)pattern sale??? hint, hint!!! Thank you for all the sizes of these cute hearts! I love this pattern,but for some reason, I’m not getting it right? I’ve cut 2 3.5 x 6.5 & when I place the white 3.5 sq on the bottom, I have way too much fabric left. Am I to cut it off then do the same on the other piece? Love coincidences. Last night I decided that today I would make some heart blocks as filler for a quilt top. Woke up several times trying to do the math in my head. So glad this link was posted on Sew Can She this morning. Thank you, thank you, thank you. Starting mine tonight. Will be sending from Australia. And also for the Dallas Police officers families of those who have lost their lives in the tragedy as well as the recovering survivors! Thank you so much! I found your blog and heart tutorial via my guild in Germany – https://www.patchworkgilde.de – thank you for sharing this! Thank you, we are referring friends to this tutorial link in order to make a quilt for a friend who has just lost her husband. Thank you so much for this block! You saved my bacon today. When sewing the pieces together, what is the seam allowance? Thank you for this pattern and tutorial. i am teaching my grandgirls how to sew and this is just perfect to teach them cutting and sewing. Hi Gayle! 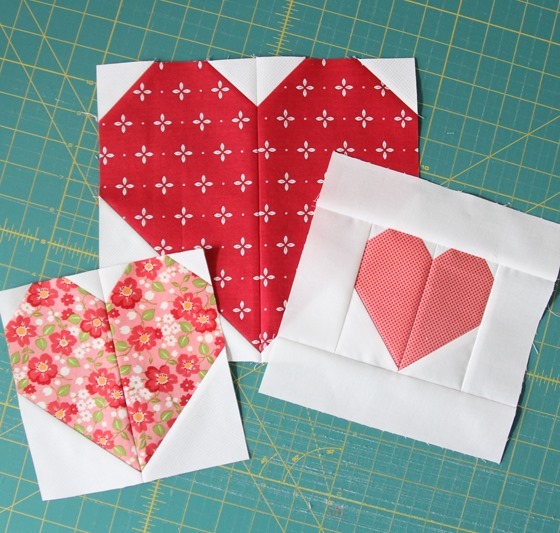 The hearts after sewing on the background corners should be 5 1/2″ if you are making the 5″ finished hearts. So trimming them down to 5″ before sewing on the borders would be way too much, and they’d lose the heart shape. 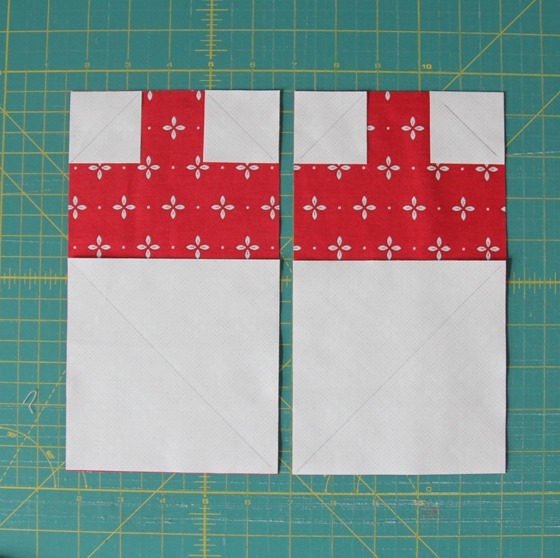 You can just trim the block up to 5 1/2″, but any more than that will make it not look like a heart!